Ambika Niketan Temple stands by the side of River Tapi in Surat. 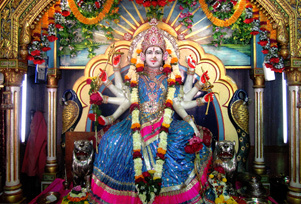 The two-storied structure, built in the year 1969, houses the idol of Ashtabhuja Ambika – an avatar of Shakti. Goddess Ambika has ashtabhuja, meaning eight hands, and is seen looking graceful in a beautiful sari, smiling sweetly to bless all her followers. Devotees visit all over the year, but at the time of festivals, especially Navratri, the temple assumes a special look and is thronged by people from all over Surat. Small shrines of Lord Ram, Goddess Sita, Lord Shiva and Lord Laxminarayan are also located in the temple.